On Sundays, we love to have special family dinners. We gather around the table, discuss our day, laugh and consume mass quantities of delicious food. Yesterday was no exception. However, we were missing a few of our family members which made it a little strange. It was just Bill, Billy and I, but the food was still the highlight (naturally). CHICKEN STOCK, WATER, VEGETABLE OIL, MODIFIED FOOD STARCH, WHEAT FLOUR, CREAM (MILK), CONTAINS LESS THAN 2% OF: SALT, DEHYDRATED MECHANICALLY SEPARATED CHICKEN, SOY PROTEIN CONCENTRATE, MONOSODIUM GLUTAMATE, CHICKEN FAT, YEAST EXTRACT, FLAVORING, BETA CAROTENE FOR COLOR, CHICKEN FLAVOR, BUTTER (CREAM [MILK]). 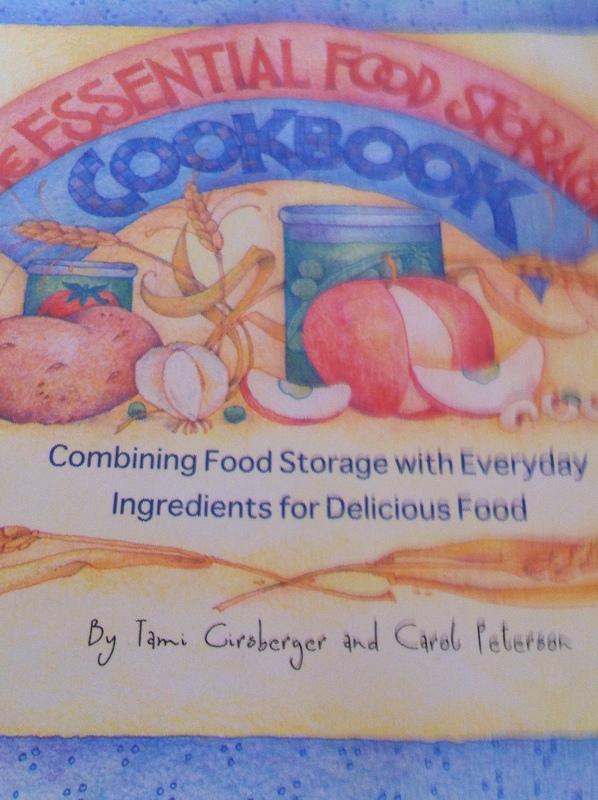 It’s really an amazing collection of health-conscious recipes with lots of “homemade” alternatives. You can get it on Amazon as well as in selected bookstores. The cream soup was delicious, simple to make and very tasty. I used some of my food storage dried milk, which is especially good. Food storage is something important that we keep on hand in case of an emergency. We have a lot of dried milk and it doesn’t last forever. Using it for recipes is a perfect way to rotate it around and keep it fresh. Put the roast in a large crock pot. Season the meat to taste. Add the carrots, celery, garlic and onion. Pour the cream soup (recipe follows) over the entire thing. The juice from the meat will mix with the soup and make a perfect gravy. Turn the crock-pot on “high” and cook for 5-6 hours or until the pork falls apart and the carrots are soft. 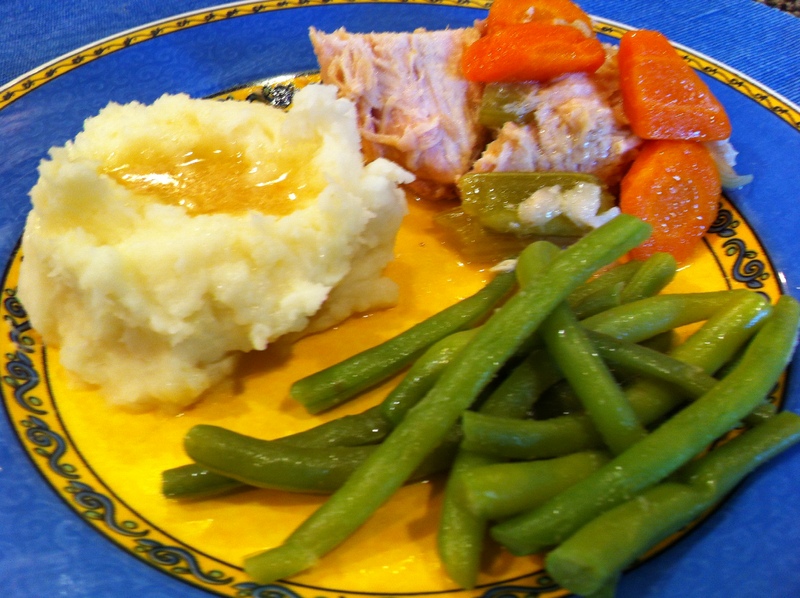 Serve with mashed potatoes, your favorite vegetables and salad. Peel and chop potatoes. Place in pan and cover with water. Bring to a rapid boil and reduce heat slightly to prevent boil overs. Once fork soft, drain. Add to Kitchen Aide mixer or use a hand-mixer. Pour in warm milk, butter and seasonings. Whip until all lumps are gone and potatoes are smooth. *I use “Johnny’s” brand because it has no MSG. Costco also sells an organic, no salt brand if you are concerned about your sodium intake. Mix ingredients together and store in an air-tight container. To use mix, add 2/3 cup of Condensed Cream Soup Mix and 1 1/3 cups water in a small saucepan. Cook and stir until thick, about 3-4 minutes. Use in recipes in place of one can of commercial condensed soup. This makes a low fat soup. If regular soup is desired, stir in a pad of butter. Boy, this sounds yummy, and I love the recipe for homemade cream soup mix. Will be making this for dinner. Thanks Lisa…hope you enjoy it. So simple and tasty too! This was a GREAT dinner! It tasted super amazing! This dinner was amazing if I can say so myself!